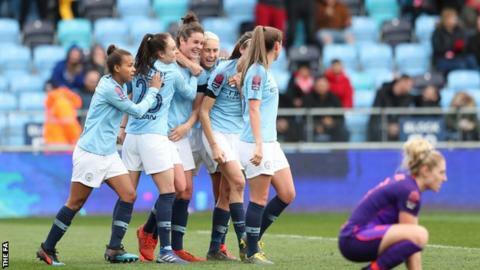 Manchester City kept the pressure on Women's Super League leaders Arsenal, thanks to a 95th-minute winner from Jennifer Beattie against Liverpool. Claire Emslie put City ahead before the half-hour mark with a deflected shot from the edge of the area and Steph Houghton almost made it two at the break, crashing an effort off the bar. A Houghton handball allowed Courtney Sweetman-Kirk to level from the spot. Beattie's dramatic late header moved them back to within a point of Arsenal. With the Gunners beating Birmingham City 1-0 in Sunday's early kick-off, the pressure was on Nick Cushing's side to secure all three points against the eighth-placed Reds. City's persistence against a stubborn Liverpool resistance eventually paid off, with Beattie nodding home a Caroline Weir free-kick. The result - coupled with Chelsea's draw at home to West Ham - ensured Women's Champions League qualification for City for next season. Match ends, Manchester City Women 2, Liverpool Women 1. Second Half ends, Manchester City Women 2, Liverpool Women 1. Goal! Manchester City Women 2, Liverpool Women 1. Jennifer Beattie (Manchester City Women) header from the centre of the box to the bottom left corner. Assisted by Caroline Weir with a cross following a set piece situation. Jill Scott (Manchester City Women) wins a free kick in the attacking half. Foul by Sophie Bradley (Liverpool Women). Foul by Kirsty Linnett (Liverpool Women). Attempt saved. Courtney Sweetman-Kirk (Liverpool Women) right footed shot from outside the box is saved in the top right corner. Offside, Manchester City Women. Georgia Stanway tries a through ball, but Demi Stokes is caught offside. Corner, Liverpool Women. Conceded by Jennifer Beattie. Corner, Liverpool Women. Conceded by Demi Stokes. Foul by Georgia Stanway (Manchester City Women). Kirsty Linnett (Liverpool Women) wins a free kick in the defensive half. Attempt missed. Georgia Stanway (Manchester City Women) left footed shot from outside the box misses to the right following a corner. Corner, Manchester City Women. Conceded by Sophie Bradley. Corner, Manchester City Women. Conceded by Amy Rodgers. Attempt blocked. Nikita Parris (Manchester City Women) right footed shot from very close range is blocked. Attempt saved. Nikita Parris (Manchester City Women) right footed shot from very close range is saved in the centre of the goal. Assisted by Jennifer Beattie. Attempt blocked. Jennifer Beattie (Manchester City Women) header from the centre of the box is blocked. Corner, Manchester City Women. Conceded by Niamh Fahey. Attempt blocked. Georgia Stanway (Manchester City Women) left footed shot from the centre of the box is blocked. Assisted by Demi Stokes with a cross. Delay in match Leighanne Robe (Liverpool Women) because of an injury. Foul by Jill Scott (Manchester City Women). Amy Rodgers (Liverpool Women) wins a free kick in the defensive half. Corner, Manchester City Women. Conceded by Laura Coombs. Corner, Manchester City Women. Conceded by Anke Preuss. Attempt saved. Demi Stokes (Manchester City Women) left footed shot from the left side of the box is saved in the bottom left corner. Assisted by Caroline Weir. Substitution, Liverpool Women. Ashley Hodson replaces Rinsola Babajide. Delay in match Stephanie Houghton (Manchester City Women) because of an injury. Attempt missed. Nikita Parris (Manchester City Women) right footed shot from the centre of the box misses to the left. Assisted by Tessa Wullaert. Substitution, Manchester City Women. Georgia Stanway replaces Lauren Hemp. Attempt blocked. Tessa Wullaert (Manchester City Women) right footed shot from outside the box is blocked. Substitution, Liverpool Women. Kirsty Linnett replaces Christie Murray. Corner, Manchester City Women. Conceded by Courtney Sweetman-Kirk. Attempt saved. Caroline Weir (Manchester City Women) left footed shot from the left side of the box is saved in the bottom left corner. Assisted by Keira Walsh. Attempt missed. Stephanie Houghton (Manchester City Women) header from the centre of the box is close, but misses to the left. Assisted by Tessa Wullaert with a cross following a corner.